Almost every region of Italy has its own kind of flatbread. The most famous are the Ligurian foccaccia, the Romagnan piadina, the Umbrian torta al testo, and of course, the Neapolitan pizza. Schiacciata, which means squashed, is the name of the main Tuscan flatbread. This sweet version is very different from the salty version which people often fill with salami. I once visited an ancient bar in the Tuscan village of Loro Ciuffenna just to eat the schiacciata baked in wood-fired ovens, something I’d highly recommend. Uva fragola aka Isabella grapes. This recipe calls for small, sweet, black grapes, in Italy known as uva fragola (strawberry grapes). People use them to make a sweet wine called fragolino. I remember when I was young, my father raved about this wine, common in Italy but not available in the UK. One day, he came home with a vine which he planted outside the french windows. It ended up running all over the wooden pergola, much to his delight. The grapes were small but sweet and I must have eaten 80% of what it produced on my own. Uva fragola actually derives from a variety known in the USA as Isabella. I have no idea how they came to Italy, but they are delicious to eat raw or in this schiacciata. This recipe uses a technique common for making pies in Italy. It’s an old peasant technique developed before the days of pie dishes. You make a dough and then divide it in two. One piece is rolled out in an oblong shape and the filling is placed on top, leaving a border around the edge. You roll the second piece out so it just covers the filling and place it on top. Then you fold the edges of the lower piece up to seal the filling in. The final appearance of the pie is a little rustic, but for a traditional countryside recipe that’s quite appropriate. Here are some pictures of the technique so that you can see how to do it. 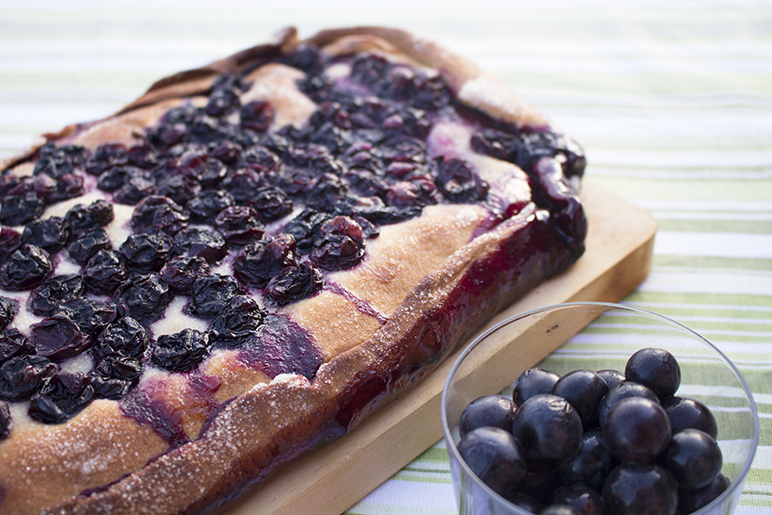 Roll out the dough, cover it with grapes leaving a border around the edge. Paint with olive oil and dust with sugar. Cover the grapes with a second layer of dough. Then fold the border up to seal the pie and squeeze well. Place the rest of the grapes on top, paint will olive oil, and dust with sugar. After baking, allow to cool before eating. The preparation time for this recipe looks a little long, but most of that is waiting for the dough to rise. The active parts will occupy a maximum of twenty minutes. If you can’t find Isabella grapes, you can substitute with any small black eating grape. However, I’ve also seen this recipe made successfully with larger black grapes. As it’s a celebration of the grape don’t skimp. Put as many of them in as you can. You eat it cold by which time the grapes have almost turned to jam and it will keep in the fridge for about a week. The grapes have pips but the Tuscans don’t care and bake them pips and all. If this bothers you, you can choose a seedless variety of grape. In Tuscany, olive oil is used to the exclusion of butter in cooking. This means that you should use it to grease the pan and also to make the dough stick together. This gives the schiacciata an interesting flavour. Don’t be tempted to use any other kind of oil as it will change the taste. Olive oil is the true taste of Tuscan cooking. Look at all those lovely grapes! Buon appetito! Dissolve the yeast in a little of the water. Put the flour, the sugar, the salt, and the olive oil in a bowl and mix together. Add the dissolved yeast and the rest of the water. Don’t add it all at once as you may need less depending on the flour. Bring together into a dough. Knead the dough for about ten minutes and then make into a ball. Place the ball in a clean oiled bowl, cover the bowl with a damp cloth, and leave in a warm place for a couple of hours to rise. After a couple of hours, the dough should be about twice the size that it was. Divide it into two pieces. Heat the oven to 180° C / 350° F.
Roll one piece of dough out until it’s about half a centimetre thick and then place it on an oiled baking tray. Cover the dough with half the grapes, leaving a border of about 1 ½ centimetres (3/4 inch) around the outside. Paint the grapes with a little olive oil and then sprinkle four tablespoons of sugar over them. Roll the second piece of dough out to the same shape as the first piece but so as it’s just enough to cover the grapes. Place it over the grapes. Paint the border of the lower piece of dough with olive oil and then fold it up onto the upper piece to seal the grapes in. Press with your fingers to seal it well. Cover the top of the schiacciata with the remaining grapes. Paint them with a little olive oil and sprinkle a further four tablespoons of sugar over them. Bake the schiacciata for 35–40mins. Leave to cool down completely before cutting into slices and serving. Concord grapes will work perfectly. They are actually the same cultivar as Isabella. Let me know how it goes. I’m really glad it came out well. The pine nuts sound a great addition. The grapes pips can be a bit crunchy, but that’s the way the Tuscans like it. If you come up with an easy way of removing the pips let me know.